Back in May of this year, one Harold Camping of the Family Radio predicted the end of the world and many of us had a field day repeating, analysing and mocking this gentleman's announcement of the Rapture. For those not quite familiar with the term, the Rapture is the Biblical ascension of God's elect people, approximately 200 million people, into heaven. - That's 200 million out of 7 billion; I'll let you ponder those numbers for a moment. - For further information, you can click over to my blog posting May 21: The End of the World (Afterword May 22) for Biblical references, a video interview with Mr. Camping and this press release from the New York Police Department: "We don't plan any additional coverage for the end of the world. Indeed, if it happens, fewer officers will be required for streets that presumably will be empty." This struck a chord with many people as this particular posting had the highest numbers of pageviews in the history of this blog. As a matter of record, I think my second most popular posting was the one about Michele Bachmann eating a corn dog. See Michele Bachmann, a Corn Dog and the Oral Office. I will take that to mean readers are strongly interested in both religious and phallic symbolism. Go figure. Rick Perry - the governor of Texas - the guy who just held "The Response" a week ago in Houston -- that day of fasting and praying to Jesus to fix all our problems - just announced he's running for president - and that makes him the most dangerous person in the country. If you thought George Bush was bad, you ain't seen nothing yet! And here's why you should be worried. Gov. Perry is affiliated with a fanatical right wing Christian group called the New Apostolic Reformation. They were involved in setting up the big "pray-in" in Houston. Do a little research on these guys -- it'll blow your mind! The New Apostolic Reformation believes that certain Christians (them) have been hand picked by God to take over society. These people are insane, and their goal is power, dominion and total control. 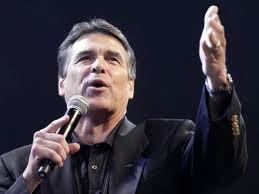 Now you know the real reason why Rick Perry held his big everybody pray to Jesus event. Now you know why he says he's "doing what he's supposed to be doing - following God's calling to serve". Now you know why Rick Perry is running for president. And now you know why Rick Perry is the most dangerous person in America! The New Apostolic Reformation is a movement in Protestant Christianity largely associated with the Pentecostal and Charismatic movements. The basic thesis asserts that God is restoring the lost offices of church governance, namely the offices of Prophet and Apostle. The New Apostolic Reformation has Pentecostal and Charismatic origins, with those traditions' interpretations of the nature of the ongoing ministry of the Holy Spirit within a believer. Unlike some parts of Protestant Christianity, these include the performance of miracles (such as healing), prophecy and the direct revelation of Christ to each believer. Although the movement regards the church as the true body of saved believers, as most Evangelical Protestants do, it differs from the broader Protestant tradition in its view on the nature of church leadership, specifically the doctrine of Five-Fold Ministry, which is based upon a non-traditional interpretation of Ephesians 4:11. Forrest Wilder describes the New Apostolic Reformation as having "taken Pentecostalism, with its emphasis on ecstatic worship and the supernatural, and given it an adrenaline shot." Wilder adds that beliefs of people associated with the movement "can tend toward the bizarre" and that it has "taken biblical literalism to an extreme." The organization has become increasingly involved in political activism, with many of its leaders supporting the 2012 presidential candidacy of Rick Perry. Perry, [Forrest] Wilder argues, is venturing into new territory for an aspiring presidential candidate by courting pastors who are followers of the New Apostolic Reformation. The NAR apostles, he writes, have "bizarre" beliefs, including "some" who "consider Freemasonry a 'demonic stronghold' tantamount to witchcraft" and one who thinks the Democratic Party "is controlled by Jezebel and three lesser demons." These unusual beliefs, says Wilder, wouldn't be so remarkable except for the NAR's "growing fascination with infiltrating politics and government." NAR adherents want to "not just take 'dominion' over government, but stealthily climb to the commanding heights of what they term the 'Seven Mountains' of society, including the media and the arts and entertainment world. They believe they’re intended to lord over it all. As a first step, they’re leading an 'army of God' to commandeer civilian government." What is the "right" answer? I mean the real "right" answer? Anybody? Anybody at all? The issues we're talk about are complex, really, really, really complex. "If it was that easy, it would be done by now." Since it isn't done now, is it safe to assume that it isn't that easy? So why is it when I ask for the "right" answer, Palin, Bachmann and Perry raise their hands? The best minds on the entire planet have worked on these issues and do not necessarily know what the "right" answer is and yet these candidates and by proxy their backers know exactly what to do. Really. You guys know what the "right" answer is. All of you. Amazing. Would I seem like a doubting Thomas if I said that I may be harbouring just a smidgen of misgivings about you guys running the show? George W. Bush decided to invade Iraq. Several months before the invasion, Donald Rumsfeld stood up at a press conference and told everybody the war would last no more than 6 months and cost no more than one billion dollars. What do we know now? There was no link between Iraq and Al Qaeda. There were no weapons of mass destruction. The war has lasted longer than 6 months and cost more than a billion dollars. Squinting into the television lights, Bush later called on Faeze Woodville, 44, of Stratford, Pa., who cares for two sons at home. "Mr. President," she began, "I would like to know why it is that you and others in your administration keep linking 9/11 to the invasion of Iraq when no respected journalist or Middle Eastern expert confirmed that such a link existed." She got a burst of applause—this was no Bush-Cheney campaign audience. The President and other administration officials have often implied a link between Saddam Hussein and the attacks on the Pentagon and World Trade Center, and polls have shown that lots of Americans believe it. Bush was not so forthcoming with this answer. "I appreciate that," he began, which is the way he often begins the answers to questions he does not appreciate. He repeated some of his stock lines about how 9/11 had changed his view of foreign policy and then got even bigger applause by concluding: "Removing Saddam Hussein makes this world a better place and America a safer country." Chatting afterward with reporters from TIME and The Washington Post, Woodville said she was disappointed by the non-answer. "He must think we're morons," she said. That's why this keeps happening. We're morons. The question isn't about Sarah Palin being a moron. The question isn't about Michele Bachman or even Rick Perry being a moron. It's about us being morons. We want some great parent-like leader to take on the responsibility of keeping the electricity on so we can go out and play like a bunch of children. We don't want to responsibly participate in running the country; we just want to vote for the next snake-oil salesman who's going to promise to deliver our peanut butter and jelly sandwich with a nice day in the park. We haven't got a f**king clue of what the "right" answer is, any more than those vying for the reins of power and as a consequence we all fall victim of overblown false promises which in no way represent the practical reality of us collectively tightening our belts and putting our noses to the grindstone. We are all jumping up and down on Oprah's couch with unbridled enthusiasm for that which we don't understand. Is Sarah Palin or Michele Bachmann or Rick Perry a moron? Yes, but guess what? So are we. Fivefold Ministry is a Christian belief that the five offices of Apostle, Prophet, Evangelist, Pastor and Teacher referred to in Ephesians 4:11 remain active and valid offices in the contemporary Christian church. Dominionism, in the context of politics and religion, is the tendency among some politically active conservative Christians to seek influence or control over secular civil government through political action, especially in the United States.